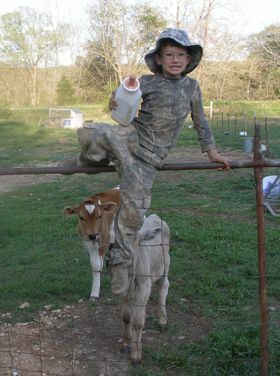 Baby calves are so enjoyable to have around on the farm. We love watching them romp and play. Here’s one of our baby cows named Havala. 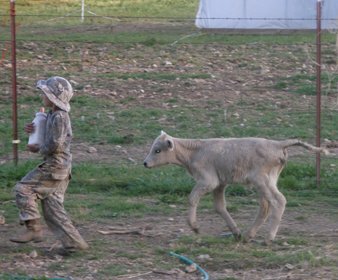 Here, Hava is chasing our 8 year old as he makes his way over to one of the other calves. We plan on keeping her here on the farm to produce beef cows for us hopefully for many years to come. Over the last few months she has really grown and fattened up! Our children love feeding the calves their bottles. And the calves love the children and that bottle they carry! Havala and Tex are doing great and growing leaps and bounds and eating lots of fresh grass. When you buy very young, little calves, there is always a cloud of unknown in the air. Once you get them over the hump and they start really thriving…it is exciting to watch them take off! We will soon be weaning them off the bottle. It sure has been nice having a milk cow to provide raw milk for the calves — it has helped these bottle fed calves really gain the nutrition they needed to thrive.